We greatly admire Toyota’s production system and their overall management system. But what we don’t appreciate is the engineering mindset that created this unique and innovative system of management. We also do not appreciate that this could be a principal reason why the leaders of most organizations struggle with Lean. Curious – Likes tough problems. Interested in how things work; a strong desire to learn and figure things out. Creative – Likes to make things and see how they function; imaginative. Desire to improve – Understand problems and make things better. Problem-solver – Likes to try things out to see if they work, or not, and why. Attention to details – Knowing from experience that success means attention to details. Close to the product or process – Physically and mentally near where value is created. Persistent – Keeps trying even after repeated failures; not afraid to revisit the past. Thinks logically – Rational thinking required to make simple parts and complex systems function correctly. Elimination of errors – Interest in the causes of failure lead to fewer errors. Respects competence, not authority – Respect is earned. TPS was created with a “What’s wrong and how do I make it better?” mindset, not a “What’s right and how do I maintain it” mindset. Incurious – Avoids tough problems. Takes shortcuts. Low desire to learn and figure things out. Lacking creativity – Prefers to follow the herd; low level of imagination. Success oriented – Highlights success and loathe to admit failures. Forward-looking – Looks to the future; not interested in the past. Numbers oriented – Focused mainly on financial metrics. Distant from the product and process – Physically and mentally distant from the places where value is created. Impatient – Quick to give up; quietly abandons things that don’t work on first or second try. Thinks illogically – More susceptible to illogical thinking and decision-making traps due to biases and ego. Overconfident – More interested in self than others; poor listener. Political – More concerned about appearance than substance. Repeats errors – Disinterest in the causes of failure leads to repetition of errors. Respects authority, not competence – High rank assumed to mean competence. It should be apparent that the mindset of an engineer is more likely to create Lean management while the business mindset is more likely to create conventional management. In fact, innovation in management usually comes from engineers: Frederick Winslow Taylor, Henry Ford and Charles Sorensen, Frank Woollard, and Taiichi Ohno. Yet, remarkably, engineers that move into high-level positions in business often forget their engineering mindset and instead conform to the business mindset of their peers. So, just putting an engineer in charge won’t solve an organization’s many management problems. Nevertheless, engineers have proven to be innovative management thinkers time and again. What we do know is that TPS, an engineer’s approach to management, works quite well. Why not learn an engineer’s approach to leadership? My engineering education coupled with my genba kaizen experiences led me to approach the problem of Lean leadership from an entirely different perspective. Most researchers and authors approach Lean leadership from a social psychology, organizational behavior, or traditional leadership perspective, and often have M.S. or Ph.D. degrees in those fields. That education limits their perspective and thus their ability to solve an important problem that has vexed many for several decades. I moved beyond the simple view of Lean leadership as a set of desirable behaviors to a wider and more detailed view that concretely shows the relationship between Lean leadership beliefs, behaviors, and competencies. When compared to the leadership beliefs, behaviors, and competencies in conventional management, the contrast is truly remarkable, and you will quickly realize how accurate the description of business mindset, shown above, is. 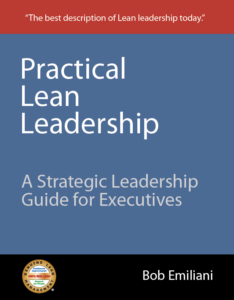 Learn about this in my workbook Practical Lean Leadership: A Strategic Leadership Guide For Executives. Further application of my engineering perspective and genba kaizen experiences enabled me to expand on this work. I began to see leadership as processes and identified ways to improve leadership process that are simple and effective, and which make use of Lean tools and methods that people already know how to use. It’s really an amazing advancement in leadership. 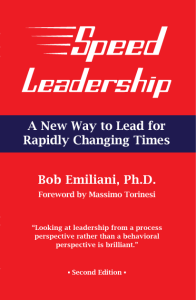 Learn about it in my new book Speed Leadership: A New Way to Lead for Rapidly Changing Times. The engineering mindset is by no means perfect. And not every engineer possesses the mindset I described above (nor does every business person). Yet, is it a mindset that is persistent when it comes to wanting to solve big problems. I think you will agree that this mindset has solved some big problems and advanced the understanding and practice of Lean leadership well beyond the current view.